The CM-200 Contact Microphone is a perfect compliment to any tuner that offers an audio input jack. The contact microphone can be positioned to get a more sensitive reading, while allowing the tuner to be positioned for easier reading. The Cm-200 Pick-up/Contact Microphone detects the tone of an instrument and sends the signal directly to the tuner or amplifier, even at sensitive levels. Use with flute, saxophone, clarinet, guitar, voice, and many other applications. 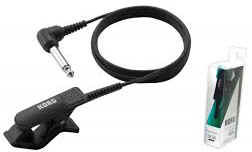 The jack is a 1/4" male phone connector the 5 foot long cable is a shielded for efficient transfer of sound. A light weight earphone that is small and comfortable. Six foot of wire, lets you move freely while you use your metronome. 3.5mm (1/8") miniature plug - fits all metronomes.